You have successfully build your business and also have clients who pay you. But, there is one thing that worries you time and again – Customer Retention. It is an on-going process and sometimes the key to long term success of your business. Most often than not, you are not the only one offering whatever you have to offer to your customers. There is competition everywhere (and is only growing), no matter how you augment your product / service to position it differently. 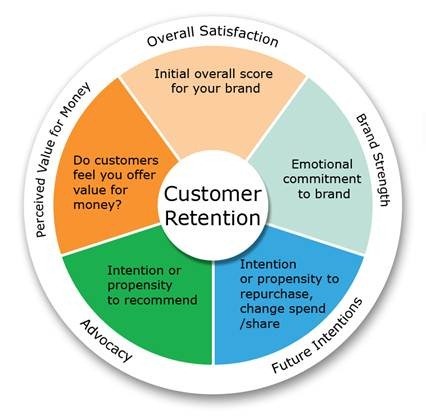 I happen to fall on this diagram on customer retention somewhere on the Internet. I highly condemn the thought process with which it was drawn at first place; I am not sharing the source for obvious reasons. It talks about “Advocacy” and “Future Intentions” which is a consequence of having repeat and regular business and not the cause of it. Strength of a brand is an effect of having done business repeatedly. The rest points are very generic and may or may not define the process of retaining customers. Your clients/customers will not hesitate in comparing you with others in spite of best of service and relationships. Here are a few tips that may help you retain customers for a longer time than usual. I am not recommending a research survey for customer satisfaction at all. This is what almost all companies do on a regular basis and they may improve incrementally as well. However, no matter how big a company you are, take out time to talk to your customers. Conversations are better than check boxes on a paper. This way you will not only get know their needs but you may as well find what the hidden needs are that market may value. Honesty is the best policy. Try to trick your customers and they will abscond in no time. With social media, it’s easy to find the best deal available and customers allow genuine profits. Genuinely answer their queries and show them that you are concerned. Do not delay in answering to complaints and suggestions. They are probably the best thing your business can get after money. This is where most of the complaints arise. Promising more than what you can offer and setting expectations at a level which you may not be able to fulfil is no better than abusing your customers. Some customers have expectations that are unrealistic and completely unattainable will never be happy. For others, be realistic about what to expect with your service or product. Don’t degrade or upgrade the quality of your service or product abruptly or unnecessarily. Don’t take loyalty for granted. Many business owners need to get out of the “we already have them” mind set and treat their current customers just like they treat prospects. Nourish and flourish. In today’s world full of options, a customer can choose other providers. Don’t take loyalty for granted and don’t underestimate the power of one-on-one relationship building. Customers return when they feel a connection with the brand and when there’s a mutual sense of belonging. Do keep on reminding them that they are with the best. Being good is no longer good enough. You need to do something truly outstanding (and relatable to your market) to really remind them and get them talking about you. Once you exceed expectations, customers will be referring their friends, relatives, neighbors, and co-workers. All customers are not kings! (Some might disagree, but I firmly believe in this) Not every customer is a genuine customer. Some of them are bound to leave you, let them. If you have a great product or service, you have the right to choose your customers. Choose wisely and the right ones to go long term retaining them. "Retaining customers in competitive world! ", 5 out of 5 based on 1 ratings. 2011 & 1983 Final Cricket World Match – Uncanny Similarities that will surprise you!